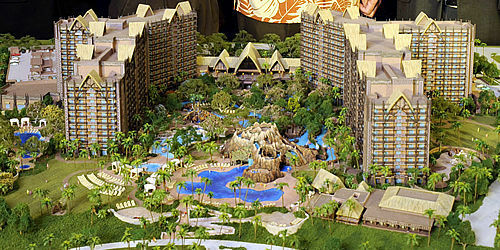 Disney is coming to the island of O’ahu, Hawaii. No it will not be another theme park but rather a Disney themed resort. Ko Olina Resort & Marina scheduled to be completed by 2011 will be a 830-unit resort on 21 acres of property. The resort will feature 350 hotel rooms and 480 DVC villas in two main buildings, surrounding an extensive volcano-themed water play area that includes water slides, rapids and waterfalls. A spa, conference center, kids’ club, gardens and wedding lawn are also in the works.